This weekend the weather was ideal for working in the garden. Highs today were in the 70s and was still 69°F at 8:00 pm. Even warmer weather is forecast for the week. On Friday afternoon I visited a favorite garden center, checking out each and every offering and finally bringing home mostly more of my same favorites. Last year Alyssum, an annual, bloomed well into winter so I decided to use it this year again to fill in. I chose a pretty violet, rather than white. At the store I figured out exactly why I needed each plant and where it would go, but once home I could not match ideas to reality, so most are still unplanted. No regrets, but in fact I still need to focus on cleaning up the perennial beds and mulching. This task that has taken much too long. The sunny, warm weather this weekend helped motivate me though and I was able to make some progress, but the beds need serious renovation. I expected just to pull weeds and spread the mulch but there are many plants that have become so overgrown and entwined with neighboring plants, it is taking a long time to clear small spaces. Daylily, tradescantia, bog sage, another unknown type of salvia, perennial sweet pea and columbine are the biggest offenders this year. Tansy and yarrow are also getting out of hand. The soil looks beautiful though and I am finding lots of earthworms this year. It was satisfying to spend the daylight hours outside. This time of year there are no mosquitoes, no air conditioners humming. It is pleasantly quiet and peaceful. 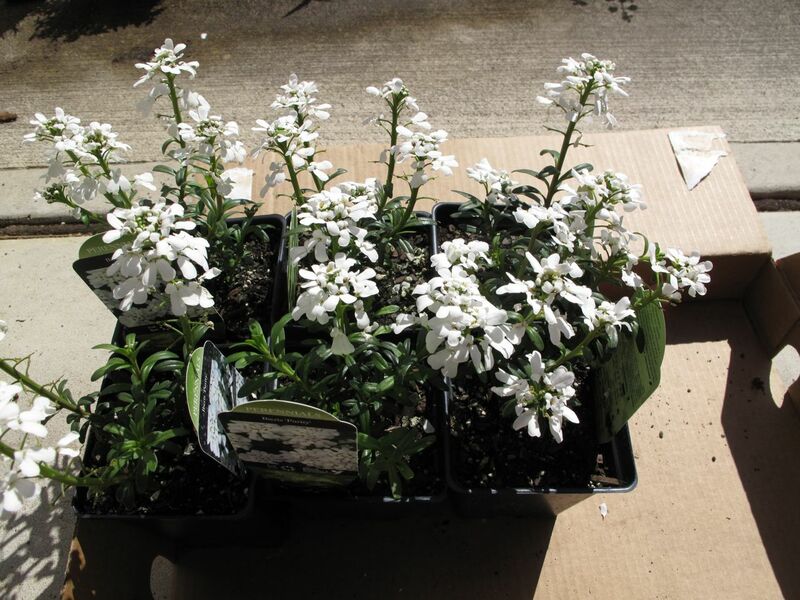 This entry was posted in garden and tagged almanac, alyssum, iberis sempervirens 'Purity', spring garden on April 7, 2013 by pbmgarden. You are so methodical. Don’t do too much at once–watch the hands. Cindy and I attended a talk at the library by Roger Mercer, the nationally known daylily breeder. I learned a lot. He shared some interesting stories. Cindy’s herb garden is really beautiful. Trying to be careful. My hand is pretty well recovered fortunately. The Mercer talk sounds interesting. Can’t wait to hear all about it and see the herb garden. Yes, it is great, although I never plan very well so end up just tucking them in among everything else. In the end it works ok though. Wasn’t it glorious? I am fired up for the week ahead. What is your favorite garden center? I have different favorites, depending on the objective, but am always on the lookout for more sites to explore. 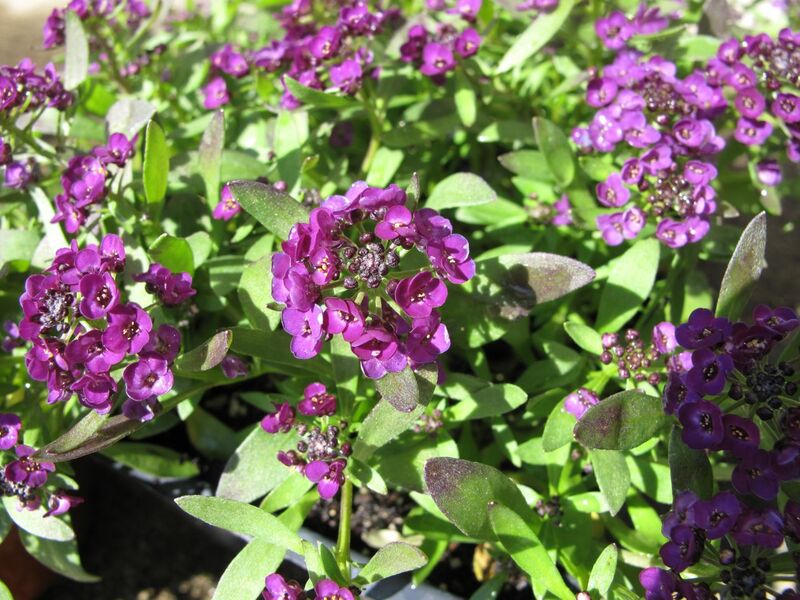 I love the purple alyssum and if you are in need of a plant swap as you begin your renovation, let me know. Happy gardening! Yes, spectacular weather. I have relied on Southern States in Carrboro for years. It’s very close and well-stocked and the people are friendly. By the way, just ordered The Essential Earthman: Henry Mitchell on Gardening. Had never heard of him until seeing the title of your blog. How wonderful that you had such lovely warm temperatures to tempt you out into the garden to do some work, try not to do it all at once, take it easy to start with! I’m sure once your plants are all in, they will look beautiful for the rest of the year. The warmer days are nice and I hope you soon will be warming up too. I have been overdoing it but it feels good to be back in the garden. I hope the Iberis are more successful this year – they really are pretty. And I like the sound of a creeping lemon thyme… It’s slowly warming up here now, but rain is forecast so don’t know if I’ll get out there yet! I hope the Iberis will work out too–I really love it. The weather is really testing you isn’t it? Spring has to be around the corner for you Cathy! I agree it is a perfect time to garden whether in the 40s, 50s or 60s with no mosquitoes and only some bird song to keep me going…half done and half to go just cleaning up…next are the weeding, extending beds, planting, the veg garden, the containers and on and on. Love the plants…can’t wait to go nursery shopping for container plants. Your weather must have cleared up a lot for you. So glad. That Alysum, is a lovely bright colour. I think so too. Last year’s white was very nice also, but this seems more fun.